MANjr writer Jeremy Johnson takes the Scion FR-S through the best and worst of driving in and around Los Angeles. LOS ANGELES- It’s been nearly ten years since Toyota submitted a car for the sports category. Somewhere in the 90’s they put away their leather jacket and retired the supercharged Supra and MR-2 Spyder. Toyota settled in nicely into responsible adulthood, releasing sensible car after sensible car inspired by economy and reliability. Rinse. Repeat. One reasonably priced car after another rolled off of the automakers assembly lines, filling driveways and carports and city streets with practical and dependable options for every walk of life. That’s nice. Commendable even. Cars impact people’s lives like few other consumer products can. We count on them to be there at the ready for work and play. We trust our lives to their safety standards and our finances to their dependability. Toyota understands that and hits the sweet spot over and over again. Though… when done properly, cars can be all that and so much more. Shoot, they can even be fun! Thankfully, in Toyota President Akio Toyoda passionate drivers may have the staunch ally they need. Toyoda-San demanded sport and excitement from his engineers and developers and we are just now beginning to see the fruits of their efforts. The Scion FR-S embodies this mission. To answer question number 3, YES! Not Lamborghini goes 60 in 1st gear fast, not even Subaru WRX STi human catapult fast. But yes the FR-S is fast and it is glorious. You will be hard pressed to have more fun between 0 and 80 miles per hour. The car is so successfully tuned and so tightly suspended that each one of it’s 6 manual gears hits like a sling shot pulled to its firing length. It manages to feel fast from the moment you let your foot off of it’s snappy clutch. This car is not just sport mode “go kart handling” like that foresaken mini Cooper S. The 200hp Boxer engine emblazoned with the Toyota and Subaru name helps keeps the weight of the car flat to the ground and the optional exhaust roars with thanks each time you bury the throttle. The “R” in the FR-S of course stands for rear wheel drive. This means at any moment in your drive you can switch off your safety hat and drive like a stunt man. Go ahead and let that rear end slide out or chirp your tires. Oh yea… it looks good on you. It’s not dangerous if you do it in the right place at the right time. Don’t be a dummy! Look twice! Speaking of looking twice, if you manage to get your hands on one of these awesome cars your first stop should be the auto parts store for two of those 5 dollar blind spot mirrors. Save your neck the pain. In fact just bring them with you to the dealership and stick them on before you drive off the lot. The drive is an A+. Next time you see a FR-S drive by take a look at the driver. 9/10 times they’re smiling. I know I was. and an interesting cup holder design that I think I like. Irrelevant. The car’s interior is built around the driver, the seats are bolstered high enough to be called sidewalls. You will not be thrown around in this car’s warm embrace. An extremely stiff yet comfortable suspension and the near absence of moving parts contributes to a very tight and rattle free ride. The back seat can barely fit two duffel bags. 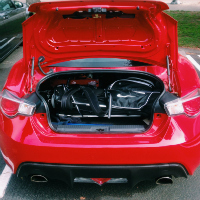 The trunk can fit a set of golf clubs. Good enough for me. Track guy? Put down the seats and slip racing tires in the trunk. Dare I say cheap? Brand new drive off the lot for just under $25k. Lease it for $300 a month. It drives like a car twice the price. It’s a home run. Sure it could use a little more torque. Yes, a turbo engine would be incredible. Blind spot mirrors sure… But that’s really all I’ve got. I drove this car in canyons and on freeways, up the coast and in bumper to bumper. It’s fun pulling out of my driveway, it’s fun changing lanes downtown. It’s really, really fun searching for an apex on a winding road. I grew attached very quickly and separation anxiety set in hard on my last day. I didn’t want to give it back. In Los Angeles you spend far too much time in the car. May as well enjoy every minute of it. Print article This entry was posted by Jeremy Johnson on April 16, 2014 at 4:32 pm, and is filed under Cars. Follow any responses to this post through RSS 2.0. Both comments and pings are currently closed.